It is possible to rent the whole apartment or the individual suites. The Caserta bed and breakfast - Caserta Deluxe - is located on the first floor (without elevator) and has a surface of 110 square meters. can accommodate up to 5 guests. The whole structure has been recently finely renovated to make guests' stay more comfortable. It consists of a large living room / kitchen, two elegant double bedrooms with XL bathrooms in the room. One of the two bedrooms (Suite Deluxe) also has a queen-sized sofa bed for a third person. 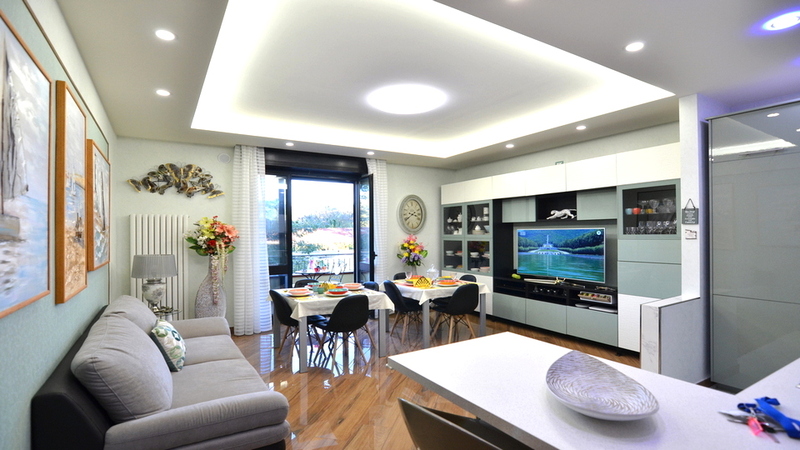 The living / kitchen area is very bright and fully equipped. The private bathrooms for each room are a "PLUS" of the apartment, they have an XL size, are finely decorated and have showers for two people. A pleasant play of light completes the pleasure of these environments. The Caserta bed and breakfast - Caserta Deluxe - is very quiet and bright. The sober and functional furnishings, the soft colors and the natural light of the apartment create an atmosphere of absolute relaxation. There is air conditioning and heating in every room. Free WIFI, minibar, safe, hairdryer, courtesy set, bed linen and towels, impeccable cleaning. Parking outdoor car; possibility of private parking on request. The location is strategic, a few steps from Corso Trieste, a 15-minute walk from the Royal Palace of Caserta and the train station. An ideal place for a pleasant stay for leisure or work. SUITE DELUXE can comfortably accommodate up to 3 guests with a double bed, plus a double sofa bed. XL private bathroom, free WIFI, air conditioning, independent heating, minibar, safe, courtesy set, hairdryer, iron, bed linen and towels. Facilities Free WIFI - 1 Smart TV Netflix connection - Minibar - In-room safe - Hairdryer - Iron - Complimentary toiletries - Air conditioning - Independent heating - Bed linen and towels. SUITE SUPERIOR can comfortably accommodate up to 2 guests with a double bed, plus a double sofa bed. Bed type 1 double bed, plus a double sofa bed.